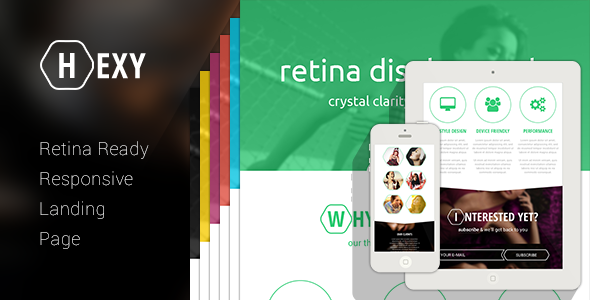 HEXY is a Retina Display Ready Responsive Landing Page Theme built with HTML5 & CSS3. It is perfect for presenting a digital agency, app page or the future launch of a web site or any other service. This template is designed to be fully responsive on any screen size & resolution. It will look great on any Desktop, Tablet or Smartphone and will have stunning crystal clear graphics for any Retina Display devices. You can test the responsiveness of the theme on www.responsinator.com. All images used in the preview & screenshots are NOT included in the download package. They are replaced with a placeholder images with the original dimensions and format, which can easily be replaced by the user. All assets used in the preview are freely distributed for non commercial use under the Creative Commons license. Added jQuery BEZ for smooth scrolling. Added “back to top of the page” button. This is the initial release of this theme.